As Comic-Con winds down on the shortened Day 4, we conclude our coverage with two panels that exemplify what Comic-Con is all about. As promised, we dissect the “Comics Design” panel of the world’s top logo designers deconstructing their work, coupled with images of their work. We also bring you an interesting panel of ethnographers, consisting of undergraduate and graduate student, studying the culture and the varying forces that shape Comic-Con. Seriously, they’re studying nerds! Finally, we are delighted to shine our ScriptPhD.com spotlight on new sci-fi author Charles Yu, who presented his new novel at his first (of what we are sure are many) Comic-Con appearance. We sat down and chatted with Charles, and are pleased to publish the interview. And of course, our Day 4 Costume of the Day. 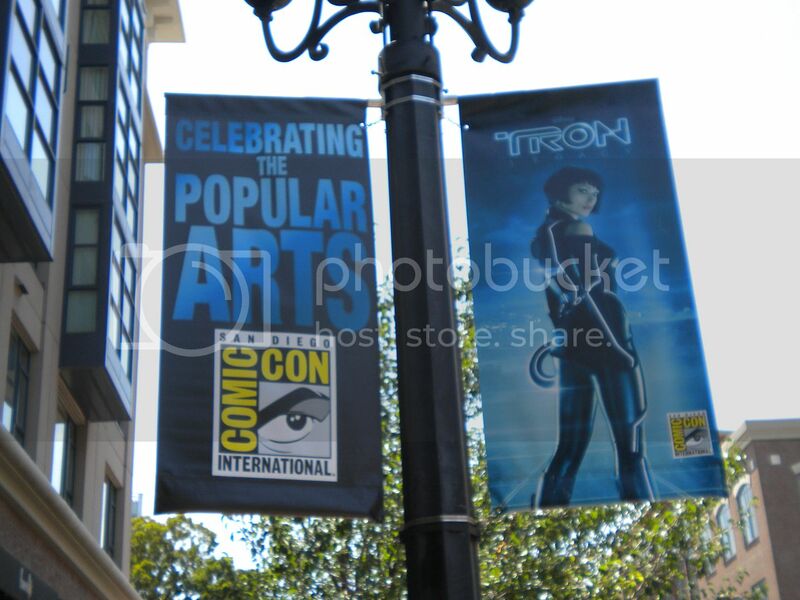 Comic-Con 2010 (through the eyes of ScriptPhD.com) ends under the “continue reading” cut! All right class, settle down, settle down. My name is Mr. Ross, but you may call me BR. Welcome to Pop-Culture Science 101. I know what many of you are thinking: “Science is boring; I just don’t get it.” I can understand those sentiments. But that’s only because of the ways you’ve been taught in the past. Today is going to be different. On this, the third day of the Science Week collaboration between ScriptPhD and CC2K, we decided to have a bit of silly fun and cover a couple of traditionally esoteric science topics from an angle I doubt any of you have considered before—pop culture icons. So get out your notebooks and pens, today’s lesson begins now! Please click “continue reading” for more. Part of every great Hallow’s Eve, in addition to carving Jack ‘O Lanterns, fake blood and candy, involves a good old-fashioned horror film. To help our loyal fans prepare in advance, ScriptPhD.com enlisted the help of our good friend Bryy Miller, screenwriter and president of Lefty Films, to grab sneak peek screenings of two Halloween-themed releases, Dark Country and Trick ‘r Treat, at the inaugural Long Beach Comic Con, as well as two very rare, special comics panels. His reviews and coverage, below the cut. In a recent interview with ScriptPhD.com, Watchmen screenwriter Alex Tse described Hollywood’s recent spate of comic book and graphic novel adaptations as jumping on a bandwagon. 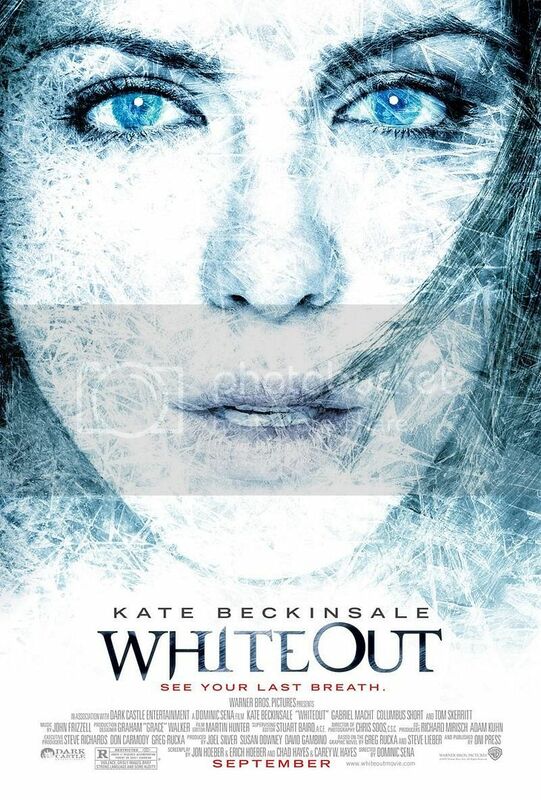 So let’s continue the momentum and hop aboard the South Pole Express to Warner Brothers’ Kate Beckinsale-starring remake of the classic graphic novel Whiteout by Greg Rucka and Steve Lieber. ScriptPhD.com reviews this cool-as-ice thriller and provides some real-world gripping tales of scientific heroism in Antarctica under the jump. Who watches the Watchmen? A whole lot of people! One of the spring’s biggest breakout hits was director Zack Snyder’s cinema adaptation of the Alan Moore and Dave Gibbons classic 1989 graphic novel, Watchmen. ScriptPhD.com first caught up with one of the Watchmen screenwriters, rising star Alex Tse, during this summer’s Los Angeles Film Festival, and sat down with him recently to talk about the experience of working on the blockbuster. Before being contracted on the Watchmen project, Tse got his big break when his first script, Sucker Free City, was produced by Showtime Television and directed by Spike Lee. His current projects include a collection of sci-fi and comics screenplays, including the 1951 collection of science fiction short stories The Illustrated Man, the 2005 American thriller novel The Winter of Frankie Machine, the anime Ninja Scroll, and a film adaptation of the upcoming graphic novel Battling Boy by Paul Pope. Tse grew up in the San Francisco area before attending Emmerson College in Boston. Our full transcript under the “continue reading” jump. Well, faithful readers, our press room interviews have been transcribed, our complete pictures have been edited and labeled and sleep has still not been had. Someday. To make it easier to enjoy all the Comic-Con goodness from start to finish, we have condensed our four days of coverage in one place. Enjoy and thanks so much for following the journey with us! Day 1: Includes pictures and scoop from the Warner Motion Comics, Battlestar Galactica Retrospective and Mad Science: The Fiction of Science Fiction panels, and press room transcripts of Psych and Burn Notice. Day 4: Includes exclusive pictures and transcripts of two final Sunday panels: Supernatural and the long-awaited Comic-Con appearance of David Tennant with the Dr. Who panel. 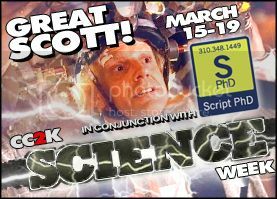 All four days of coverage include the ScriptPhD.com Costume of the Day, chosen from an array of pictures that you can browse through on our Facebook fan page and extra side interviews and scoop from all the wonderful actors and writers we ran into. But wait! There’s more! I’ve saved two special surprises for our last post. The first is our ScriptPhD.com one-on-one sit-down with 24 writer/executive producer David Fury. We go in-depth behind the show’s themes of terrorism, torture, national security and how they extend to the real-world law enforcement reaction to the show. We also have a free fan giveaway of three copies of the Comic-Con 2009 40th Anniversary souvenir books handed out only onsite. To read our interview and enter to grab your copy of the book, please click “continue reading”. Greetings! Day 2 of Comic-Con was a very scaryspecial occasion: Official Star Wars Day. Yes, the personal hygiene was questionable and the light sabers were many, but the ScriptPhD soldiered on to bring you our coverage of as much science entertainment content as you can pack in one website. Today we start by putting the science in science fiction with the special 10th Anniversary Farscape reunion panel, including information about their new DVD box set release and upcoming projects. ABCs electrifying new science-fiction serial thriller FlashForward provided a world premiere sneak peek of the first 15 minutes of the pilot and a special guest surprised the audience. Our press room coverage from Day 2 includes some phabulous physics with CBSs Emmy-nominated Big Bang Theory, including a one-on-one interview with Emmy nominee Jim Parsons, who talked to ScriptPhD.com about his journey into science and preparation to play a science geek, and Bones, including interviews with star Emily Deschanel and showrunner Hart Hanson. 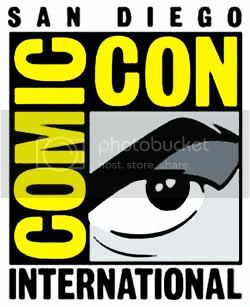 We also have our daily Comic-Con Costume of the Day and the Light Saber Count Tally. Stay along for the ride with ScriptPhD.com. Click continue reading for more!